The Puppy Bowl is a television show that highlights a variety of dog breeds playfully romping in search of a chew toy to score a touchdown on a miniature football like field. They roam back and forth across the field in an unorganized way while audiences await the random scoring across the field. Pups can be seen waiting in the barking lot area posing as tailgating fans before game play commences. Each player is introduced before the game starts or resumes as they enter the stadium. These introductions include the player's name, a picture, age, breed, as well as a short, witty "quote" or message about the puppy. At the game's opening, The Star Spangled Banner plays as noted in professional sports gatherings to display patriotism. Hamster pilots help navigate the field at several different points to give the audience another vantage point as you would see in a professional football game (much more elementary quality when compared to views of a professional game). The puppies are cheered on by audience members who are noticed in random frames throughout the program. They are also seen making comments or giving praise after a score has been made. A cool down tub is an interesting detail mentioned which is offered for the world's furriest little athletes. During breaks for the puppies, another vantage point is viewed through the water bowl camera while they take a moment from this unusual play date. Once a puppy has successfully acquired a touchdown, the hedgehog cheerleaders roam the field for viewing pleasure and added emphasis on the achievement. As in professional sports, the Puppy Bowl also requires a referee to watch the playing field and keep players on track. He also dictates when breaks are to be started and calls fouls as necessary. Fouls can be called and flags can be thrown on the field just as in traditional football for instances such as excessive cuteness during play and excessive puppies piling on the referee. All in all, this is a family friendly program that is sure to catch your attention. Details have been added comparing professional sports to a playful and animal-friendly sports gathering. People of all ages interested in animals or football may find this show to their liking. Get ready for the cutest sporting event of the year: The Puppy Bowl XV Pregame Show! Join James Hound, Rodt Weiler and Sheena Inu as they unleash inside scoops on this year's canine competitors and offer insights from the Ruff and Fluff locker rooms. Can you believe it?! It's Puppy Bowl's 15th Anniversary! Animal Planet has pulled out all the stops to bring you the boldest, brightest, and cutest event of the year Puppy Bowl returns with more puppy players, representing 51 shelters across 23 states. The twelve-month wait is over! The cutest, fuzziest, fluffiest event of the year has finally arrived Animal Planet's Puppy Bowl returns for its fourteenth season! With more puppies, more rescues, and a brand-new bone shaped stadium! Get ready for the cutest sporting event of the year with the Puppy Bowl XIV Pregame Show! Join us as we unleash inside scoops on this year's crop of canine players with exclusive interviews from the Ruff and Fluff locker rooms and pre-kickoff analysis. So, you think you're a Puppy Bowl fan? We're taking a look back at the greatest moments from Puppy Bowl history. The biggest plays! The cutest puppies! And a sneak peek at the year's biggest surprise: the unveiling of a brand new Puppy Bowl stadium! "Pup Stars and Friends"- Experience cuteness on a whole new level and celebrate the most huggable heroes of the animal kingdom. From sports stars to furry fashionistas, meet the true champions of cute, worthy of claiming the ultimate title, Cute As Fluff! All this talk about cheese and terrible towels have you feeling a little queasy? Comfort yourself with man’s best friend. Puppy Bowl VII kicks off on the Discovery Channel this afternoon from 3-5 p.m. EST. According to the Discovery Channel, for the first time in PUPPY BOWL history, all the action will broadcast in a “stunning native 3-D version that will premiere on ‘3net’ – the new 3-D network joint venture of Discovery Communications, Sony and IMAX. Puppy Bowl is currently available to watch and stream on Animal Planet. 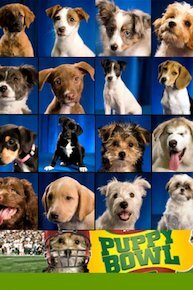 You can also buy, rent Puppy Bowl on demand at Amazon, Hulu, Vudu, Animal Planet, FandangoNow, Google Play, iTunes online.